The "smart" TriLED rail lighting system consists of some recurring components. The base of the TriLED rail system is ContiRAIL. The DualLINE luminaire characterizes itself with 2 parallel LED strips. The SingleLINE luminaire is also mounted on the ContiRAIL and exists in different lengths equipped with one LED strip. What does the TriLED Smart Lighting system consists of? For each project we make a detailed lighting study and spend the utter most care on the ergonomic aspects and light experience. Based on this study we compose a TriLED lighting system with a guaranteed performance.. The "smart" TriLED rail lighting system consists of some recurring components. The base of the TriLED rail system is ContiRAIL, which is fixed and mounted on the ceiling according to the plan of study. Several mounting brackets are available that are thoroughly explained during the project before installation. ContiRAIL can also be mounted as a pendulum or attached via chains or gripples. The rail is electrically and mechanically connected. With a standard wrench the luminaire is mounted on the rail. The luminaire then pierces automatically through the anodization layer of the aluminium rail and connects to the electricity. 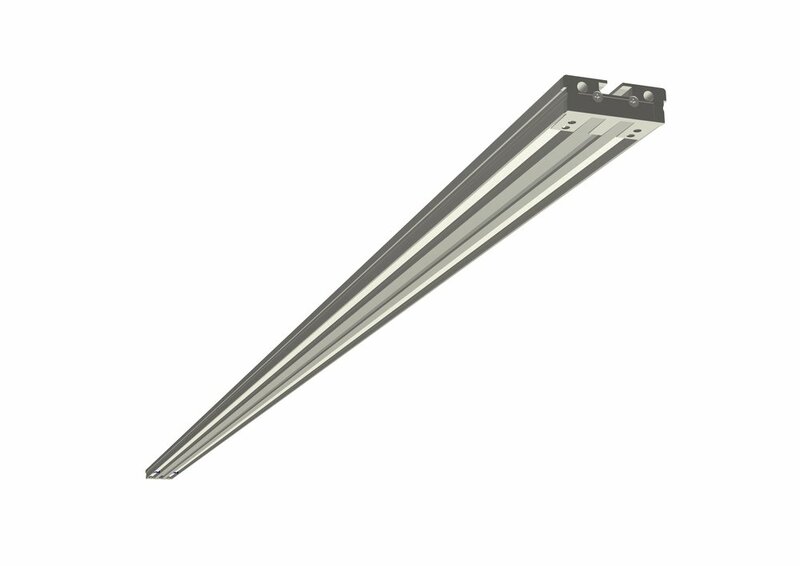 The DualLINE luminaire characterizes itself with 2 parallel LED strips herewith acquiring a high lumen output. The luminaire contains integrated controls and is mounted to the ContiRAIL. The powerful DualLINE is predominantly used in high open spaces. A high quality luminaire in aluminium with a polycarbonate front. The anodized aluminium frame safeguards a good heat dissipation of the LED. This is paramount to ensure a long lifespan. The polycarbonate front is UV resistant and ensures impact resistance of the luminaire. It can be used particularly for the lighting of indoor tennis courts of sport accommodations. The SingleLINE luminaire is also mounted on the ContiRAIL and exists in different lengths equipped with one LED strip. Made of a aluminium housing and connected to a driver control which is mounted on the ContiRAIL. The SingleLINE is usually equipped with lenses to optimize certain specific applications. The lighting study determines which lenses are installed. The main advantage of the TriLED rail lighting system is that the system works on central electrical power supply that is mounted at the top op the ContiRAIL. That's how just one 48 VDC can electrically supply several luminaires. The electrical supplies exist in two different wattage being 480 Watt en in 960 Watt. Besides the simple installation the central positioning ensures an optimal yield of the lighting system. The built-in power supply has a high yield of 94% in comparison to classical lighting systems where each luminaire is individually supplied. Yield loss could therefor occur in each device. The industrial electrical supply shares the housing with a ventilator. The ventilator is driven by a temperature control, in that way power supplies can also be used in warmer surroundings. It's also possible to deactivate the ventilator in for example heavily polluted environments. In the same housing a communication print is mounted, this ensures the wireless communication with the luminaires.